Summary from Goodreads: At first, I merely saw his face, his hands on the window ledge. Then, his whole body as he swung himself through the window. Only I could not see what he swung on. This is one of those books that I held off on reviewing because I just couldn't come up with coherent thoughts about what I did and didn't like about it. I couldn't come up with a lot - the book was decent, just not great. In the end, I decided not to worry too much about reviewing the book perfectly and just get my thoughts down as well as I could. Rachel has been locked in a tower since she was a child. She doesn't know exactly why, she just knows that "Mama" has told her that someone is after her and she's not safe out in the real world. When Wyatt comes to her little town in the Adirondacks, he hears Rachel singing, calling to him. No one else can hear her and he decides that he has to find the girl who belongs to this mysterious voice. Meanwhile, he is also trying to unravel the mystery of a young girl named Dani, who disappeared years ago - he finds her journal and hopes that it may lead to answers about what happened to her all those years ago. The ending. The last quarter of the book just got kind of weird and silly for me. I don't want to spoil anything because it's supposed to be a big secret, but I just found the whole reason that Rachel was trapped in the tower - and the resolution of the conflict - to be, well, strange. And kind of cheesy. I felt like maybe the ending would have been okay for a middle grade book, but not for YA. Saw the twists coming. Most of the twists in this book were pretty obvious and I wasn't too terribly surprised. The one exception was the mystery of what happened to Wyatt's friend - I didn't guess that one at all. Instalove. Ah, yes, the dreaded insta-love. Sometimes it works, but usually it doesn't. For some reason Wyatt and Rachel were destined to be together, so obviously they fell in love right away. Like, within minutes. Sigh... I mean, Rachel kind of had an excuse - Wyatt was the first boy she ever met, and he was cute, so she's bound to have a crush, right? And apparently the fact that Wyatt was the only one who could hear Rachel was supposed to prove that they were meant to be together. So, yeah, they were in love. Wyatt and Rachel. Both Wyatt and Rachel were likable characters. Wyatt was obviously feeling a lot of angst over something that had happened to his best friend (a mystery that is resolved late in the book) and I definitely felt for him and thought that he would be a good younger YA book boyfriend. Rachel was very sweet and I liked that she lived her life vicariously through old books and therefore acted and spoke like a character out of one of them in many ways. They were a cute couple. Moral lessons. There were some good moral lessons in the book that would probably be great for a young YA crowd. The book teaches a lesson about the dangers of drug use and talks a bit about domestic abuse. I think that Towering might work well for the younger YA set. While I wasn't enthralled with it, it was cute and sweet (though completely unrealistic) and taught some good lessons. For me, though, it was just 2.5/5 stars. Hmm I guess I won't be picking this one up. The plot doesn't sound all that great and instalove too? No thanks. Yeah, this one just wasn't the best as far as I was concerned. 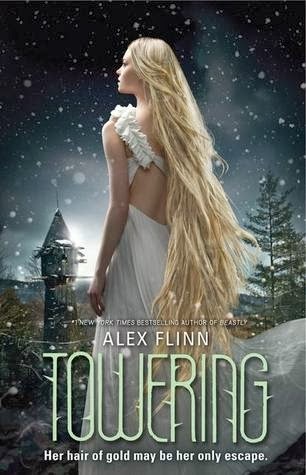 I've since seen a lot of people say that they aren't really fans of Alex Flinn, so I'm not sure if I'll read anything else from her or not. I haven't read any other Alex Flinn books and I probably won't rush out to get any anytime soon. I'm just now getting myself organized enough to go check out your tag! Sorry it took me so long! That cover had really grabbed my attention but doesn't sound like this is one I'll be picking up any time soon. Thanks for a great review! Yes, the cover is definitely what drew me in! Too bad. I loved beastly and think that it is one of the best YA books I have read. and I was really hoping that this would be the same way. Thanks for the honest review. Better luck reading next time. If you loved Beastly, you may still enjoy this one - there are definitely people who loved it, but it just wasn't for me.